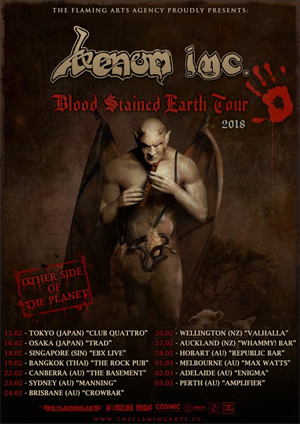 VENOM INC. - the trio formed by legendary Mantas, the Demolition Man & Abaddon - is set to kick off the next stage of their Blood Stained Earth World Tour. The first part will lead them through Asia plus Oceania, before the band haunt the UK and European clubs with label mates SUFFOCATION, NERVOSA, AETERNAM and SURVIVE. In addition to presenting tracks from their debut album Avé, VENOM INC. will also perform a bunch of VENOM classics. Full dates below. In anticipation of the aforementioned tour, VENOM INC. has unleashed a brand new lyric video for "War". Check it out below. "AVÉ Legions... May I present our recent endeavour...our new lyric video for our album track "War"! This is an extended version for your enjoyment and precedes our current list of dates as we prepare to slay 2018! Starting in Japan and taking in Singapore, Bangkok, Australia, Tasmania and New Zealand before returning to the Northern hemisphere where we start a European double headline tour with SUFFOCATION in the UK... Enjoy the new video and get your tickets now... it's gonna be a face melting tour I promise! ALL HAIL & AVÉ!"